Smoke coming out of a Crosby chemical facility where a fire broke out after an explosion Tuesday. A chemical plant in Crosby, TX, that burned after an explosion last Tuesday must stop all operations. 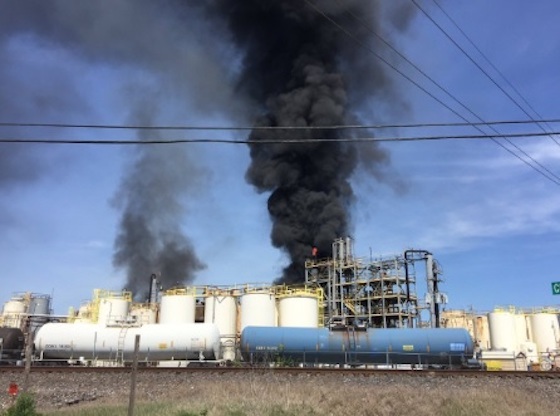 The KMCO chemical facility cannot start up again until an inspection is done by the Harris County Fire Marshal’s office (HCFMO). A temporary restraining order (TRO) ended up issued from the fire marshal’s office working with the Harris County Attorney’s office (HCAO) following the explosion that killed one person and injured two others. The explosion and fire occurred last Tuesday. When a transfer line ignited a tank full of a chemical called isobutylene, James “Bubba” Mangum, 27, was killed. Two others were taken to the hospital. As a result of the incident, there was an initial shelter in place order for a one-mile radius around the facility.